All around Ireland, independent breweries have brought the craft of brewing back into local communities. To celebrate, Ireland’s independent breweries are inviting you to join them for Indie Beer Week! From 23 June to 2 July, Kinnegar and many other independent breweries throughout the country will showcase what’s brewing in your community with a week packed full of events and activities. Come out and join us at K2, our brand new facility in Ballyraine, Letterkenny. You can enjoy brewery tours, demonstrations and hands-on practical experiences like bottling your own beer or soft drink. Learn to ferment! At Kinnegar we use fermentation for making beer but it’s also a useful way of making some soft drinks. We’ll introduce you to our friends, the yeast, show you how it all works, and mix some interesting natural drinks. DJ Mark Willis will entertain us with music and we have a live act in the pipeline too. Our friends from Scarpello & Co are also pretty friendly with the yeast and they work together to make wonderful sourdough bread. Kemal will be there on the day serving his latest masterpieces, grilled cheese sandwiches. All going well we’ll have fresh Donegal oysters and a side order of fresh Donegal live musical talent. All beer will be served in exchange for donations to local charities. We’ll have more details soon but for now, put the date in your diary and look forward to a Big Day Out at the Brewery! Admission is free but booking is essential on 074 915 8874 or 086 830 1392, or by email to info@kinnegarbrewing.ie. For any of you who haven’t already crossed every last name off your Christmas shopping list, here are some suggestions from Donegal — the place Kinnegar has helped make the coolest place on the planet for 2017. > Read unrefutable proof here! Your dearly beloved Kinnegar fan has probably spent yet another 12 months nobly resisting the urge to pilfer a Kinnegar glass from some unsuspecting Kinnegar outlet. You can reward that fortitude with a 6-pack of Kinnegar glasses. We recommend our 300ML stemmed model for use with our bottled beers but our pint glasses are also lovely. N.B. Glasses only! Brewery dogs are now collector’s items – Katie & Bruiser’s final litter was born in 2016. As worn by bona fide Kinnegar brewers! The Kinnegar-lover’s fashion statement non plus ultra. Our hoodies come in two different styles — zipped and pouch — and in several different colours. Sizes from XS to XL. The beer is thin on the ground at the best of times and photos of our new Crossroads shirts are even rarer. But the green Ts really do exist! Stocking filler, Chriskindle, treat for yourself — give somebody something they can really look forward to. Our brewery tours are informative, entertaining and enlightening. And remember, we’re moving to K2 in February or March so, even if you’ve done the tour before, there’ll be LOTS of new stuff to catch up on in 2017. 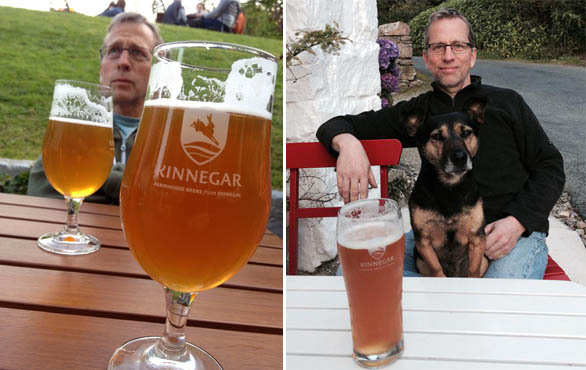 Our first Kinnegar Brewing Academy was a howling success and threw up Flying Saucer, Beoir’s 2016 Champion Beer of Ireland and 2016 Dublin Beer Cup gold medal winner. The fruits of our third academy, Bucket Brigade, can be savoured right now in pubs and off-licences around the country. Delight your beer-mad beloved with a voucher for our next 2-day theory-and-practice blitz on Saturday 22 & Sunday 23 April 2017. Order your Kinnegar Christmas gifts quickly to ensure delivery before the big day. Post & packaging costs not included in above prices (we keep them to an absolute minimum). Orders by email on info@kinnegarbrewing.ie or by telephone on +353 74 915 8874 or +353 86 830 1392.